Standing outside a NE Portland bar, my weighty and freshly autographed copy of The Best of The Best Show box set tucked under my arm, I ran into local comedian Jon Washington who, like me, was still coming down off the endorphin high of watching Tom Scharpling and Jon Wurster on stage. As we talked about the show, my friend expressed something that never entered my mind: the slightest doubt that the longtime comedy duo would be able to make a live performance work. He reminded me that what the two have is so tied to such a specific medium—the call-in radio talk show—that for some folks, there was a little bit of concern as to whether it would translate to a rock club. For me, that worry never entered my head. That was in part to do with watching clips of Scharpling and Wurster emceeing one night of Matador’s 21st Anniversary concerts, and seeing the infomercial Newbridge: We’re Comin’ To Get Ya! that the two created for Adult Swim. Their writing chops and the fearlessness that they’ve brought to 15 years worth of terrestrial and online radio comedy would surely generate something special. Okay, it helped that all the positive chatter I’ve heard about the performances the pair did in New York, Chicago and Nashville helped ease my mind. But the thought of these two flopping never occurred to me. 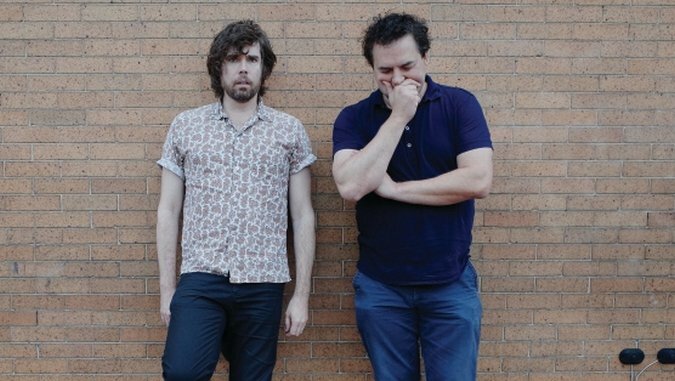 The other question that got dropped on me during the show though was even more important: what if someone walked into this show completely cold, not having any clue about The Best Show, Wurster’s many characters on it, or he and Scharpling’s brand of humor that uses much pop culture minutiae? The potential alienation factor was, and remains, high. Just try to explain the radio show to a newbie that has never heard it before, or find the perfect entry point episode for them. For most of the fans who are already on board the train, it’s hard to convince anyone else to hop on with them. I still giggle at the idea of anyone walking into the Doug Fir on Saturday night and seeing Stephen Malkmus and award-winning comic book writer Matt Fraction sitting on stage being interviewed by a squirrel puppet, and then contending with a Gene Simmons impersonator. Free of context, it could be maddening. For the superfans, the delights ran deeper as we picked apart the show for the moments crafted for this particular show, like Tom constantly interrupting Jon and the show’s backing band The Themeweavers as they tried to knock out a cover of a Wipers tune, or the two special guests Malkmus and Fraction. (Pity the poor comix scribe as he was virtually ignored as he sat through a “Name That Tune” segment featuring KISS and Pavement songs.) You wanted The Best Show, you got The Best Show, and it made for a marvelous night’s entertainment.